Can't open a website in Google Chrome? Do you receive one of the following errors while trying to access a web page? ERR_CONNECTION_REFUSED, ERR_EMPTY_RESPONSE, ERR_TIMED_OUT or maybe another error? Then you are on the right page because this tutorial will show you how to solve Google Chrome connection problems in a few different ways. If you can't open a website or web page, and get a error message, then try the following methods to fix your problem. Press the [Ctrl] + [F5] keys on your keyboard to reload the page and bypass the local cache. Press the [Ctrl] + [Shift] + [N] keys on your keyboard to open a private browsing window (Incognito). Disable your VPN (if you are using one). The first thing you should try is to clear your browsing history. 2. Press the [CTRL], [SHIFT] and [DELETE] keys on your keyboard. Note: The [DELETE] key is on some keyboards shown as [DEL]. A Clear browsing data window will appear. Basic offers the following three categories: Browsing history, Cookies and other site data, and Cached images and files. Advanced offers the following nine categories: Browsing history, Download history, Cookies and other site data, Cached images and files, Passwords, Autofill form data, Content settings, Hosted app data, and Media licenses. 4. At Time range, you select a time range (e.g., All time, Last hour, etc.). 5. Select everything you want to delete. 6. Click on the CLEAR DATA button. 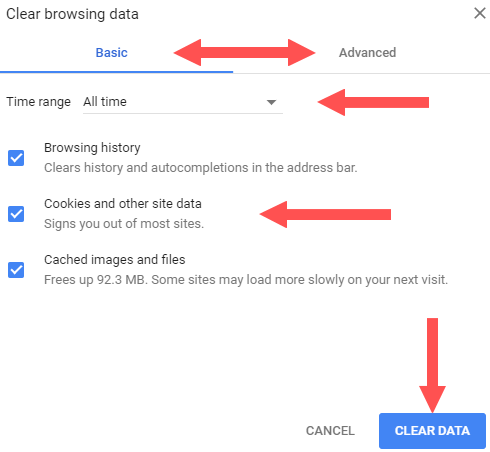 Google Chrome will now clear your internet history (cache, cookies, saved passwords, browsing history, etc.). 1. If Google Chrome is open, then close it. 2. 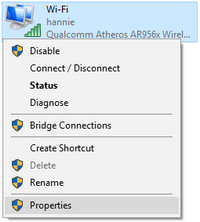 Right-click on the network (wifi or ethernet) icon located in the notifications area of the Windows taskbar and choose Troubleshoot problems. The troubleshooter will now scan for connection problems. 3. Click on I'm having a different problem. 4. 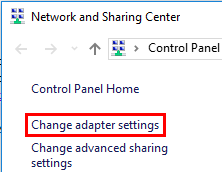 Click on Use a specific network adapter (for example, Ethernet or wireless). 5. Select All network adapters. 7. When the troubleshooter is finished, click Close. Turn off your modem and router, restart your computer, and turn your modem and router on again. Sometimes extensions (add-ons) can cause problems, so the best way to test this – is to disable all extensions and test which one is causing problems. 1. Go to Google Chrome extensions. Enter chrome://extensions/ in the address bar and hit Enter (keyboard). Click on the menu button, go to More tools and click on Extensions. 3. Try to open the website. If that solved your problem, then enable the extensions one by one and test which one causes the problem. 1. Open the Windows Start menu. 2. Type %temp% into the search bar and press Enter. 3. Delete all the files and subfolders inside the Temp folder. You can't delete the Temp files and folders that are currently in use by Windows or programs. But that's okay. You can delete the rest when you restart your PC. Clearing Google Chrome's DNS cache can resolve host connection errors. This will erase any existing information regarding DNS names and IP addresses that are stored on your PC. 2. 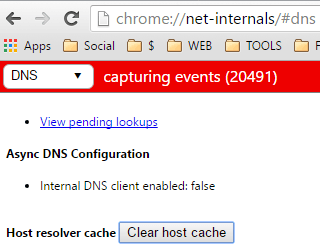 Type chrome://net-internals/#dns in the address bar. 4. Click on the ▼ icon located at the top right. 5. Click on Clear cache. 6. Click on Flush sockets. 4. Click on the Clear host cache button. 5. In the left sidebar, you click on Sockets. 6. Click on the Close Idle Sockets button. 7. Click on the Flush Socket Pools button. Google Chrome has a built-in malware scanner that can find harmful software on your computer and remove it. 2. At the top right, you click on the menu button. 5. Scroll down to Reset and clean up. 6. Click on Clean up computer. Google Chrome will now scan your computer for harmful software. 8. If you're asked to remove unwanted software, then you click on Remove. Malware (viruses, spyware, adware, rootkits, trojan horse, worms, etc.) can also cause internet connection problems. Run a Malware scan with Malwarebytes, Kaspersky Virus Removal Tool, ESET Online Virus Scanner, Emsisoft Emergency Kit, and a full system scan with your antivirus program. 1. Bookmark this page (add to favorites) and close all web browsers (Google Chrome, Mozilla Firefox, etc.). I ask you to bookmark this page so that you can easily find this page again (in case this method doesn't work and you want to try the other methods on this page). 5. Go to Temporary Internet Files and click on Settings. 6. Click on Restore Defaults. 7. Click on Delete Files. 8. Select everything and click on OK.
10. Close the Java Control Panel. 1. Open Windows Command Prompt as administrator (Admin). Switching your DNS to OpenDNS or Google's Public DNS might resolve some connection problems. 1. Open Network and Sharing Center. 2. Click on Change adapter settings at the top left. 3. Right click on your network and choose Properties. 4. 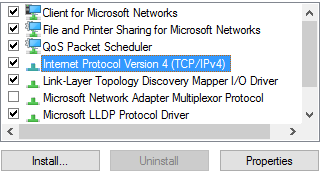 Select Internet Protocol Version 4 (TCP/IPv4) and click on Properties. 5. Select Use the following DNS server addresses. 6. Type the DNS server numbers. If you want to use Google's public DNS, then enter 8.8.8.8 at Preferred DNS server and 8.8.4.4 at Alternate DNS server. If you want to use OpenDNS, then enter 208.67.222.222 at Preferred DNS server and 208.67.220.220 at Alternate DNS server. 7. Select Validate settings upon exit. Windows will now check for problems and if there are problems try to resolve it. Now it's time to clear (flush) Google Chrome's DNS cache. 11. 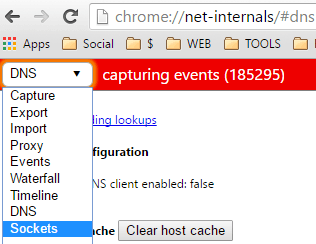 Type chrome://net-internals/#dns in the address bar and press Enter. 12. Click on the ▼ icon located at the top right. 13. Click on Clear cache. 14. Click on Flush sockets. When you reset Google Chrome, it will reset your startup page, new tab page, search engine, and pinned tabs. It will also disable all extensions and clear temporary data like cookies. Your bookmarks, history, and saved passwords will not be cleared. 6. Click on Restore settings to their original defaults. A Reset settings window will appear. 7. Click on the RESET SETTINGS button. Google Chrome will now reset your settings. Maybe the Google Chrome installation is corrupt. If that's the problem, then it's better to uninstall and re-install Google Chrome. I hope one of these methods solved your Google Chrome connection problem(s).